What are slipper lobsters? These lobster-lookalike crustaceans are also known called udang ketak. They are best eaten steamed without additional seasonings as we want to savor the natural sweetness of their meat. When I steam them, I just put fresh ginger slices, smashed garlic cloves, and some chili flakes. No salt, no soy sauce or any other seasoning needed. 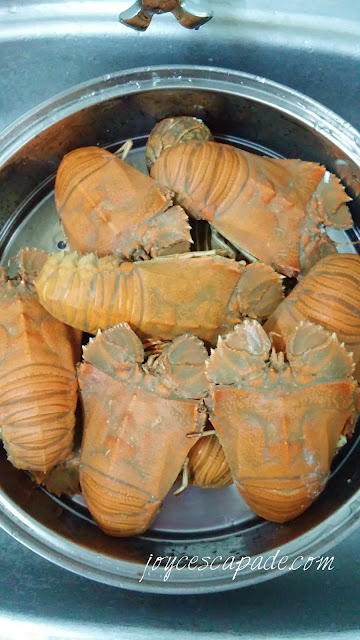 Make sure the water is boiling vigorously in the steamer (I use a stove-top steamer, not electric steamer) before you start steaming 'em lobsters. Steam for about 12-13 minutes, then off the heat, and let it stay covered for another 5 minutes before removing them from the steamer. Let's see how do we eat slipper lobsters. 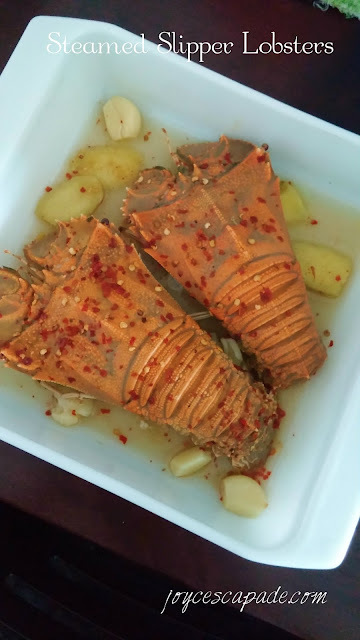 Hailing all the way from Kuala Terengganu, these gorgeous slipper lobsters are originally frozen. We thawed them overnight in the fridge before washing them under running water until all frozen bits are gone. It's recommended to scrub them one by one with a brush to get rid of dirt and sand. Then, you can either steam or boil them, up to you. Most importantly, don't add extra seasonings because they will mask the natural sweetness of the lobsters' meat. To start, get ready a pair of sharp kitchen scissors. Look for the section on the lobster that joins its head and its body. You will see a little hinge, one on the right, and one on the left. Snip off the hinges with the scissors. Once the hinges are snipped, you can now separate the head from the body. Look for the "dirt bag" at the opening part of the head and remove it because it's not to be eaten. 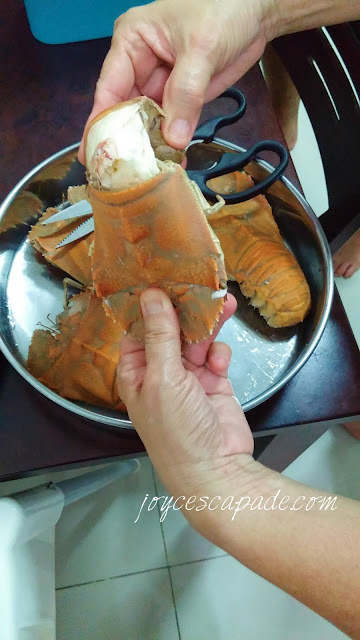 Now, use the scissors to cut open the shell (body) lengthwise. Remove the lobster's "vein", i.e. the intestinal tract (just like how you remove the intestine from smaller prawns). Tada! Ready to use to your fingers to pick the flesh from the shell and eat! My toddler loves this! The instructions above are credited to my mom-in-law who showed me every step in detail. 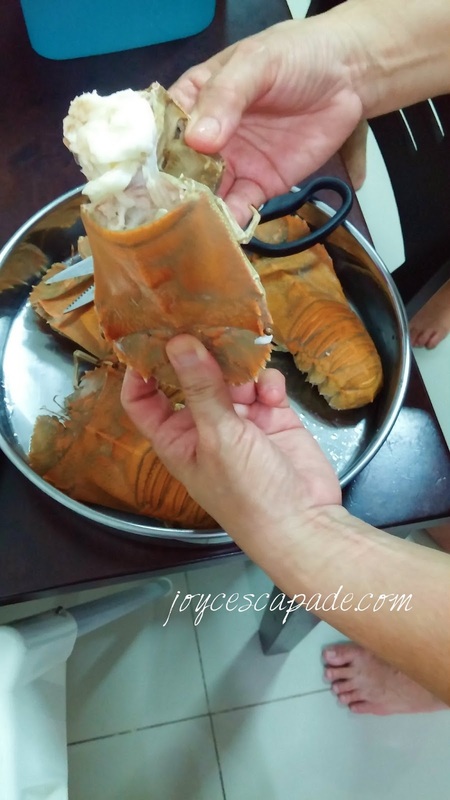 Fresh crustacean is best eating as it is; without seasoning. Wow! I would love to have one now. But I dont know how to cook them. Thanks to your step-by-step it looks easy. Wow. It looks like half of the ommon lobster I have ever seen. Thanks for the tips. 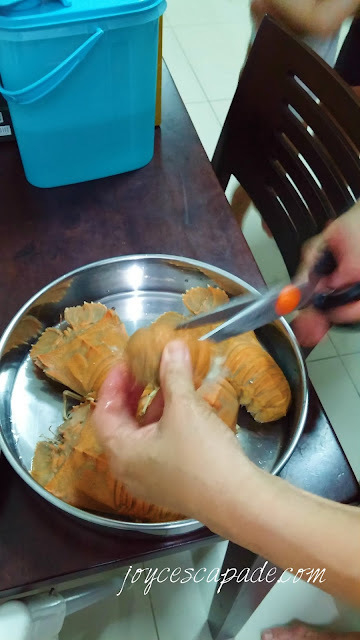 I will definitely try to open the chamber hahah with scissors someday Bila Ada lobster stock !! So yummy! I'm drooling. 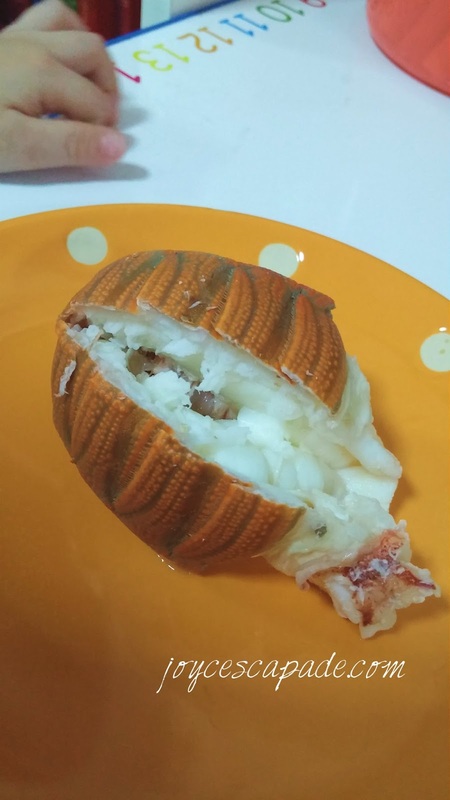 I have not tried steamed slipper lobster, ever baked topped few some cheese. Thanks for sharing. Oh! still afraid to even wash this fella before eat. But good to know how it works! looks so yummy!! I never try it before!!! make me hungry now!! That is alot of pieces!!! Love it. looks yummy!! the flesh looks so tender. wow looks very nice. thanks for showing the steps how to eat the lobsters!! It looks so good! I watched a reality tv that show this slipper lobster too. Yumms, look like there's lots of meat. Nice tips and sharing...btw, can u share where to get the frozen one? Hi Alyza, my in-laws bought the fresh ones in Kuala Terengganu and froze them before bringing them over to KL. 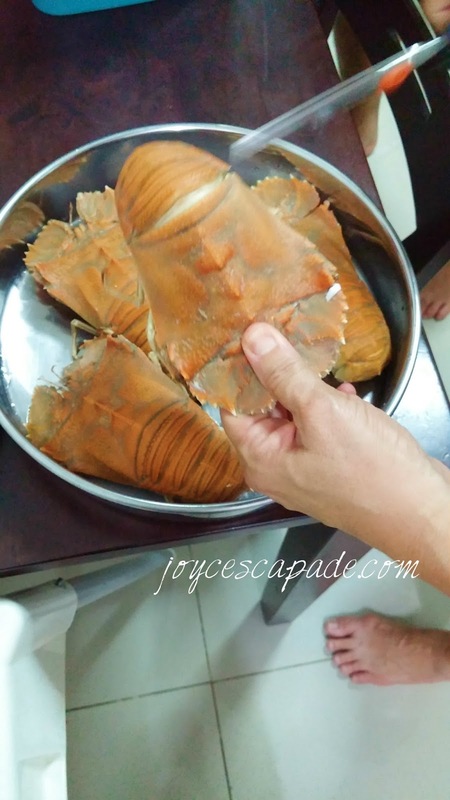 I never know it was so easy to eat slipper lobster! I haven't eat while it was stem. 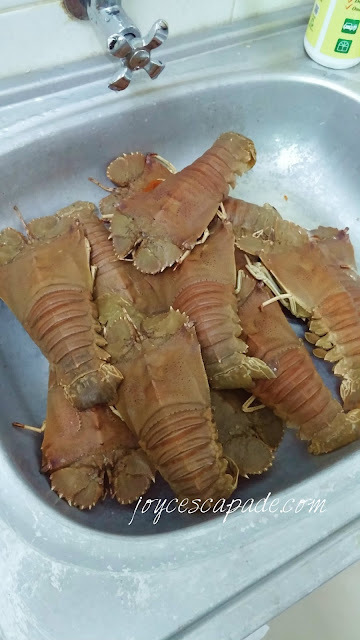 By the way the slipper lobster you get from Kuala Terengganu was quite huge and fresh, yums! It looks so alien! You make it look so easy to cook! It is looking quite nice and the way you have showed it seems like a tv show. Great piece of information. Now I know how to eat Slipper Lobsters. Nice pics. Oh wow thanks for this simple instructions, I am going to try it out.